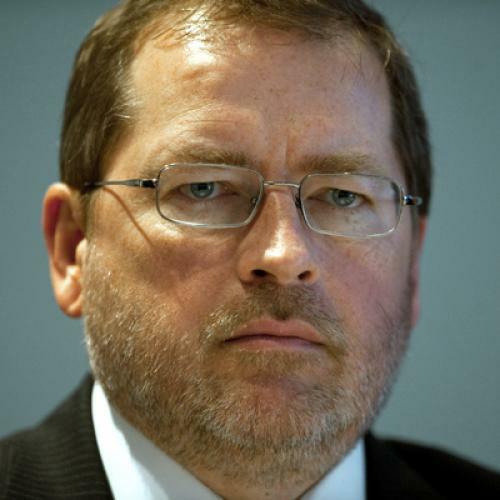 The Svengali-like influence of Grover Norquist and his Taxpayer Protection Pledge may be coming to an end. If so, it’s the end of an illusion. Norquist has long been thought to keep the GOP in thrall by wheedling Republicans into promising never, ever to vote for a tax increase. But Norquist and the Pledge never possessed much clout in the first place. Pretending Norquist was the Republican party’s puppetmaster served the interests of liberals because it made Republican politicians look like, well, puppets. It also served Norquist, who played the role with consummate skill, balancing threats of retaliation against Pledge-breakers with modest and unconvincing disavowals of any personal influence. It didn’t particularly serve Republicans, but few of them saw any reason to go out of their way to alienate an evangelist for the GOP’s most cherished principle—tax cuts über alles!—so they mostly kept silent on the subject. In 1985, Norquist—a conservative wunderkind who, not yet thirty, had already been executive director of the National Taxpayers Union and the College Republicans—founded Americans For Tax Reform, a lobby group created to help pass the 1986 tax reform bill. (ATR’s Web site says Ronald Reagan chose Norquist for the job. This is a fanciful way of saying that the Reagan White House put future attorney general Bill Barr in charge of creating the lobby group, and that Barr’s law associate Peter Ferrara, a friend of Norquist’s from Harvard, recruited Norquist, who happened to be available because he'd recently been fired by a different conservative lobby group bankrolled by financier Lou Lehrman.) According to Nina Easton’s book Gang of Five, published in 2000, Norquist initially showed little interest in his duties at ATR, instead spending much of his time traveling to Africa to pay homage to the Angola rebel leader Jonas Savimbi and other “freedom fighters” then lionized by the right for their presumed opposition to socialism (which in Savimbi’s case, at least, turned out to be fraudulent). The 1986 tax-reform bill wasn’t a project designed to capture the imagination of a hard-core libertarian like Norquist. It lowered rates and reduced the number of brackets, but only at the price of making the tax system more progressive by eliminating special-interest loopholes. It was not designed to lower taxes, which is Norquist’s chief interest in life. The capital gains tax actually increased—a data point Norquist has never emphasized. But the mantra of the 1986 reform was “revenue neutrality,” and in 1986 Norquist created the Pledge to ensure that taxation levels never went up again. It’s worth pointing out that at the time of the Pledge’s creation Reagan himself had already violated it by clawing back about half his 1981 tax cut. Four years after the Pledge was born George H.W. Bush raised taxes, including tax rates, and two years after that Bush lost to Bill Clinton, who raised taxes once again, leaving ATR’s founding mission in tatters (and putting the federal budget on the path to solvency by decade’s end). Poppy Bush’s 1992 defeat enabled Norquist to spin the straw of ATR’s failure into gold. Bush’s loss was commonly thought to have resulted from his violation, not of Norquist’s Pledge (which Bush never signed) but of Bush’s own ill-considered “read my lips: no new taxes” pledge in his 1988 convention speech. Evidence for this hypothesis has always been weak; among other difficulties, four months after his Great Tax Betrayal (i.e., at the start of the Gulf War) Bush saw his approval ratings soar to 89 percent. Bush lost mainly because of the slow recovery from a recession that the National Bureau of Economic Research, the official referee of the business cycle, didn’t declare over—hard cheese for Poppy—until December 1992. (Ross Perot did Bush a fair amount of damage as well.) No matter. Republicans took away from the 1992 election the simplistic lesson that they must never, ever, raise taxes—something they hadn’t been particularly inclined to do, of course, in the first place. This absolutist new orthodoxy allowed Norquist to position himself as the high priest of the antitax movement. But it was the orthodoxy born of the 1992 election, not the priest, that made all the difference. Norquist reportedly advised George W. Bush (who did sign the Pledge) on his tax cuts in the aughts. But Dubya wasn’t in thrall to Norquist so much as to Sophocles and Freud. Whatever “41” caught hell for doing in office (raise taxes, leave Saddam Hussein in power) “43,” playing Oedipus, did the precise opposite. To update Josef Stalin’s famous rhetorical question, how many divisions does Americans For Tax Reform have? Not a lot. Although it threatens mailings to terrorize violators of the tax pledge, it has never been a heavy hitter financially. It spent about $1.6 million this year on lobbying, which sounds like a lot but doesn’t even put it in the top 20. (Exxon Mobile, which ranks 20th, spent $9.9 million.) It spent about $16 million in independent expenditures in the 2012 cycle, mostly to oppose Democrats, two-thirds of whom won anyway. Sixteen million isn’t bad—that ranks ATR 17th in independent expenditures—but the real financial powerhouses were Karl Rove and the Koch Brothers, whose Crossroads GPS and Center For Patients Rights (an anti-Obamacare outfit) bankrolled fully half of ATR’s spending. ATR targeted one Republican, Eric Hovde, R.-Wisc., because Hovde wouldn’t sign the pledge, and Hovde did indeed lose. But it’s doubtful that the $3,547 ATR lavished on his primary defeat had much to do with it. Norquist is mainly a media creation. To TV bookers, he’s a dream talking head: Funny, blunt, smart, cynical, and never reluctant to play the role of ideological extremist. (I’ve always thought it was Norquist’s media irresistibility that kept him from paying a higher price for his extremely close ties to disgraced superlobbyist Jack Abramoff.) During the 1990s Norquist helped run the “K Street Project,” a Republican-led protection racket to prevent lobbying firms from hiring Democratic ex-staffers, but in the end that effort achieved little more than bad publicity. Norquist presides over “the Wednesday meeting,” a weekly gathering of conservatives modeled on a similar weekly meeting presided over by Paul Weyrich, an influential Republican activist who ended up being regarded even by fellow conservatives as a crank. What little influence Norquist ever had has diminished in recent years. Sen. Tom Coburn, R-Oklahoma, and House Speaker John Boehner have both openly dissed Norquist, and in 2012, for the first time in recent memory, we had a presidential election in which Republicans were actually downplaying the tax-cut issue. You want to know Norquist’s true legacy? He got Washington National Airport renamed Reagan National Airport, removing the first president’s name in order to insert the name of a president whose only lasting contribution to aviation was to fire 11,345 air traffic controllers. To George Washington, never signing the Pledge was indeed fatal. For everybody else, Norquist has never been anyone to rationally fear.